← Can We Take The Civil RIghts Era OFF The Postage Stamps? “Racism” returns to America. Where Did It Go? If the public issues of racism are back, and surprisingly to some, then this means racism must have gone somewhere, right? It is important to remember that many of us are very segregated in our lives, particularly by class. Racism over the past few decades has not been as prevalent amongst the upper classes, which includes civil rights attorneys and Ivy League professors who may be exposed to the public cases yet not the private indignities. The Upper Class holds the microphones. When 1000, or 100,000, people take to the streets and say “We’re sick and tired,” many have responded: Sick and tired of what? The bottom line is that racism has been hiding in the framework of Law and Order and Crime and Punishment. With the number of police in America, particularly concentrated in Communities of Color (including almost every school), there is a sense that “they” are being kept under control. The police are vigilant at pursuing drug use amongst poor people, amongst Black and Latino people, yet not amongst the wealthy. The police will stop and frisk people in certain neighborhoods, and yet it would be unthinkable amongst the wealthy; amongst the people with the microphones. When Harvard Professor Henry Louis Gates was treated like “just another Black suspect” a few years ago, he was exposed to the daily indignities that “they” are sick and tired of. We see Obama, Holder, Sotomayor, Thomas, Rice, and others among the elites, and want history to be under control. Yet the control of certain communities comes with a cost. As the Trayvon Martin troubles come to a boil, we have a population in New Orleans who are sick and tired after the police killed two young Black men in a week. The people of New York found out that an accidental health alert resulted in the police kicking in the door, tasering, and killing an elderly Black veteran. On tape one of the police used the “N” word. The people are sick and tired. They are tired in St. Louis when a few days ago an anonymous tip revealed that a Black woman was hauled away from the emergency room, where her calls for help were interpreted as a drug addict seeking drugs. She claimed to be in too much pain to walk, so she was cuffed and carried to the police station, where she died from a blood clot. No drugs were anywhere in her body. When people come to this country, no matter their color or nationality, they often have something in common: America the place is not the same as America the television show. Americans need to reach the same conclusion. If our awareness were based on direct experience amongst the majority of Black and Latino Americans (not just the small percentage who excel in higher education), we would not be stunned as to where the “Race Card” is coming from. We can all question about how to play the cards, or even how to get folks to the table, but we are being irresponsible to think that “race” needs to stay under the table. Nobody in their right mind can honestly suggest that if a White teenager were shot in Sanford, Florida, that his killer would have walked freely for a month… as if the police don’t know what to do. As if the district attorney has never been presented with a homicide before. Despite Martin having his cell phone on him, and likely having identification on him, his parents did not know he was dead until filing a Missing Persons report the next day. The killer’s parents were both courthouse personnel, and the killer desperately wanted to be involved with law enforcement. 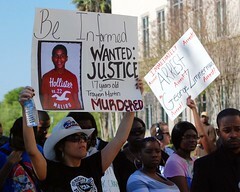 Is the true problem that the police and district attorney don’t know what to do when one of their own commits a crime? Whatever the answer, millions of Americans are sick and tired of the banality of racism. It is time to take the microphone form those who wield it without speaking truth. This entry was posted in Commentary, Race and tagged Black people, Henry Louis Gates, police shooting, Race card, racism, St. Louis, Trayvon Martin, White Plains. Bookmark the permalink. 1 Response to “Racism” returns to America. Where Did It Go?